I hope you're enjoying this beautiful fall weekend. I made this card for the challenge over at Less is More. It's clean...it's simple and it's got newsprint! ditto, its clean,simple and has newsprint, great card, what a great birthday toast. Great card Doni! Nice use of the newsprint. Oooh love this clever idea Doni. Hope you get well soon ... I can sympathise as I'm struggling to shake off a chesty cough. Think I need a holiday!!! This is terrific Doni... it would be a super card for a chap! CAS and stylish Doni, love this! Now that looks inviting !! Great card Doni! 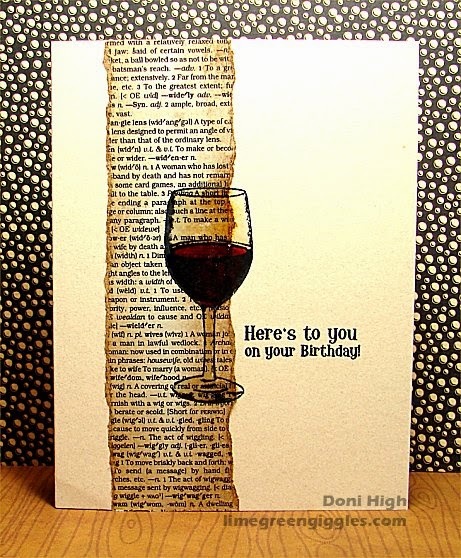 What a great card, that wine looks good enough to drink! A wonderful male card. Love the great CAS design and the clever use of newprint.